Movie Night: Do you like scary movies? I know I sure do! 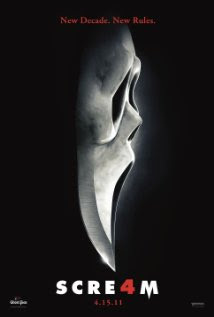 I missed the opening night of scream 4 but I caught a matinee screening of it today & it was definitely worth the wait. I have been following this movie almost religiously since I heard it was being made. I watched all the teasers & trailers, viewed all the stills, listened & read all of the interviews & articles, I even watched the premiere. All that movie stalking paid off because the scream 4 is amazing. It so takes me back to 1996 when the first scream premiered and redefined the horror genre. Well they did it again. I never like to give too much away by discussing plot but I have to say that this is the first horror/thriller movie that successfully meshes technology/internet with blood and guts. I really enjoyed seeing a lot of the old cast members come back and I surprisingly enjoyed the new cast members as well. There are old horror movie scares that are mixed seamlessly with the "new rules of horror." Scream 4 definitely raises the bar for future post modern horror flicks for the Internet 2.0 age. If you are looking for a great film with a ton of twists and turns & also some laughs thrown in, than scream 4 is your movie. It's smart, funny & twisted at the same time.